EnACt is an infrastructure to support and enhance Alberta's existing practice-based research networks as well as academic and community practitioners conducting primary care research. What's New in January and February? What's New in Fall & Winter? What's New in July and August? What's New in May and June? What's New in March and April? What's New in December and January? What's New in July to September? Our recent research using Cognitive Task Analysis sought to understand how we can move past successful demonstrations to widespread adoption of the Patient Medical Home in Alberta. Read our findings based on 42 interviews across 18 Alberta family medicine clinics. Understanding how different physicians and team members (individually and collectively) manage their patients living with chronic diseases. A primary care-based pragmatic clinical trial to evaluate antihypertensive medication timing in adults with high blood pressure. Within a fee-for-service payment system, Family Physicians (FPs) use a variety of (payment) service codes. In Alberta, the majority of FPs bill fee-for-service. Economic theory predicts that high-volume FPs will strive to maximize their time and income by seeing a high number of patients and selecting more lucrative fee codes. Understanding how Nurse Practitioners (NPs) currently practice is important to the development of interprofessional teams, access to health services, and modernizing health care delivery. Adopting innovations that transform practice and care delivery is easier said than done. We are exploring how to move from successful pilots among "early adopters" to reaching the mainstream – crossing the valley of death. Exploring whether Alberta family physician endoscopists are able to achieve standard benchmarks in colonoscopy. To understand patients' and family physicians' perspectives on the need for a mobile-health prediction tool for Knee Osteoarthritis progression to improve patient care. Project has moved into its second phase to co-design a Knee Osteoarthritis self-management tool with patients and physicians. 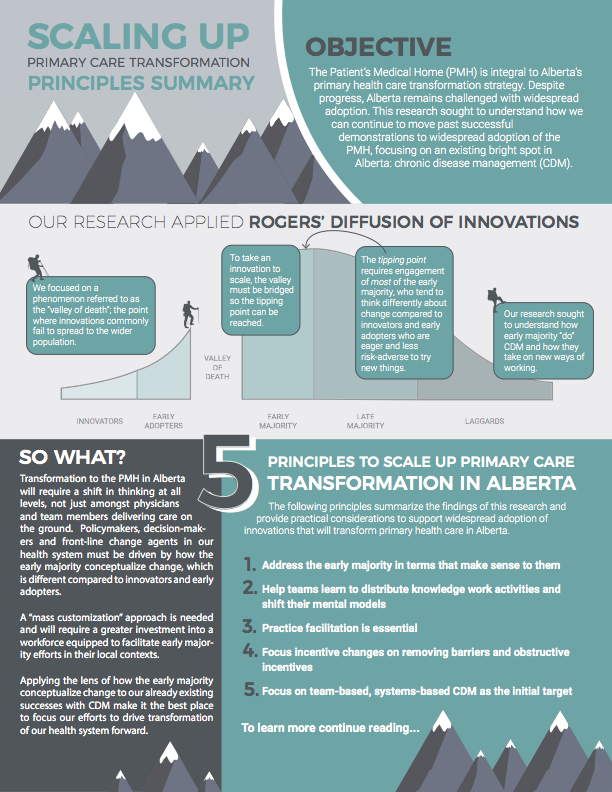 EnACt wants to see primary care research in Alberta flourish with innovative and meaningful large-scale studies; we allocate resources to develop projects and pre-award support. This support may include one-time consultation, on-going guidance, project collaboration, or having a dedicated Coordinator or Research Assistant for your project. EnACt collaborates and connects with many organizations and research networks within the Alberta primary care setting. The EnACt team also includes our esteemed Research Assistant: Dorna Sadeghi, undergraduate student in Science, at the University of Alberta. Please contact us for more information or to discuss your project. When chronic disease management (CDM) is done well it can achieve significant clinical improvements quickly and across large populations. In the Alberta context, providing the right tools and supports for practices engaging in CDM requires more than replicating what worked for the leading teams; it requires understanding how different teams conceptualize CDM and perform the work day-to-day. By interviewing teams who have been successful with CDM and teams newly engaging in CDM we are developing valuable insight into strategies and supports that teams new to this work will find useful. To date we have found that more advanced teams distribute macrocognition functions (decision making, planning and re-planning, monitoring and detection, sharing knowledge, coordinating) across all team members, engage in high-trust activities, are less hierarchical in organizational structure and deliberately engage in meaningful use of their EMR. BedMed is about medication timing. In particular this project is designed to determine if switching the time of day blood pressure medications is taken to bedtime (compared to conventional morning use) reduces death, stroke, heart attack or hospital admission for congestive heart failure. BedMed aims to test findings from the MAPEC trial, where Spanish researchers found a 61% reduction in adverse events similar for all individual components of the primary outcome (including death from all causes, stroke, myocardial infarction, new angina pectoris, heart failure and occlusion of the retinal artery). If true, a switch to bedtime prescribing would have more impact on the health of hypertensive Canadians than whether high BP is treated at all. BedMed is being conducted in Alberta, British Columbia and Manitoba. This study involves multiple phases and focuses on high volume GPs in Alberta. Phase I of the study set out to characterize factors associated with high volume GPs. "High volume" was defined as seeing greater than 50 patients on average per day. A logistic regression model was created and a sample of GP administrative billing data from Alberta Health (2011-2016) was combined and analyzed with GP provider demographic characteristics and provincial geographic parameters. Analysis revealed that high volume GPs tended to avoid service codes representing time-intensive care, were typically older, male, worked part-time, and tended to be in the north. International Medical Graduates (IMGs) were also much more likely to be high volume GPs. Phase I of this study has facilitated our next step (Phase II), to explore whether there is an association between the number of patients seen per day and patient health outcomes. Phase II analysis will model the risk of an emergency department visit or hospitalization for patients with one or more chronic condition diagnoses (diabetes, heart failure, chronic obstructive pulmonary disease, coronary artery disease and asthma) by GP daily patient volume, adjusting for other variables, for the period 2011-2016 in Alberta. These results are important for policy-makers when considering the design of a payment system to optimize patient outcomes in Alberta. This research endeavor began as an Alberta-specific project surveying Alberta NPs on their practice patterns. There are 436 registered NPs in Alberta and 214 of these responded to the survey. 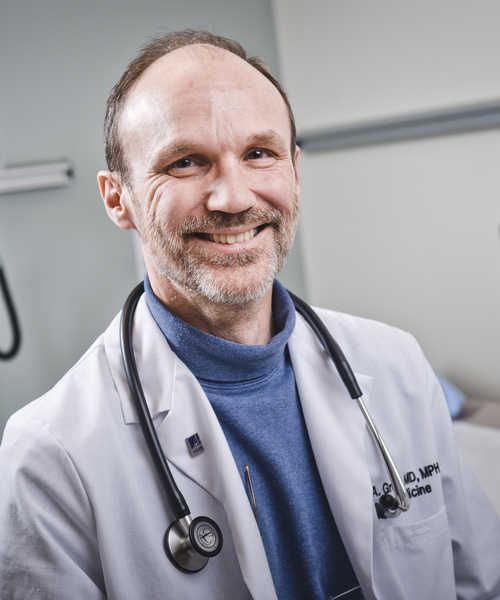 Results revealed that: only a small subset of NPs in Alberta work in a primary care setting, very few NPs have responsibility for large panels of patients, NPs can manage between 800-1000 patients in their panels, and there is potential for NPs to play an expanded role in primary care. In addition only 11.5% reported satisfaction with the community’s understanding of their role. The project is now expanding the survey to Saskatchewan and Manitoba to compare and contrast NP practice patterns across the 3 western Provinces. The gap between innovation and widespread adoption is where many initiatives get trapped. 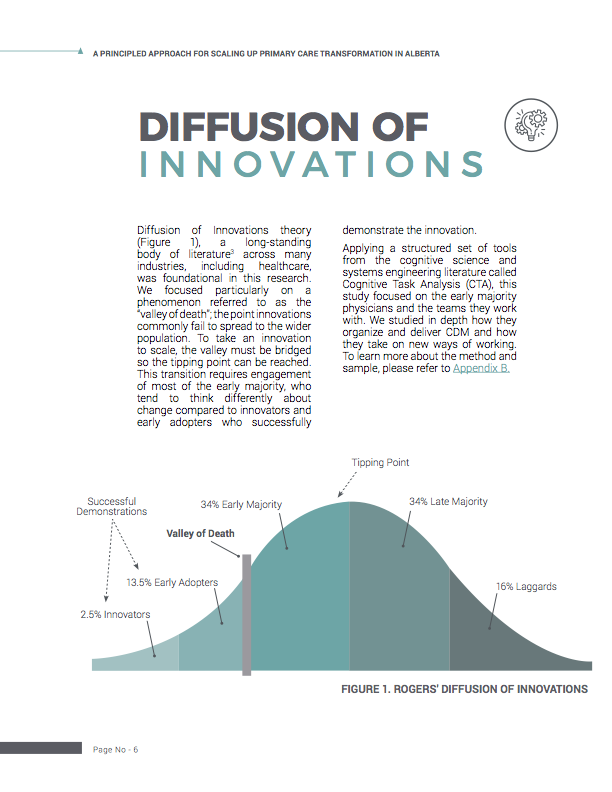 Diffusion of Innovation theory (a long standing, body of literature across many industries -including healthcare) calls this the "valley of death". 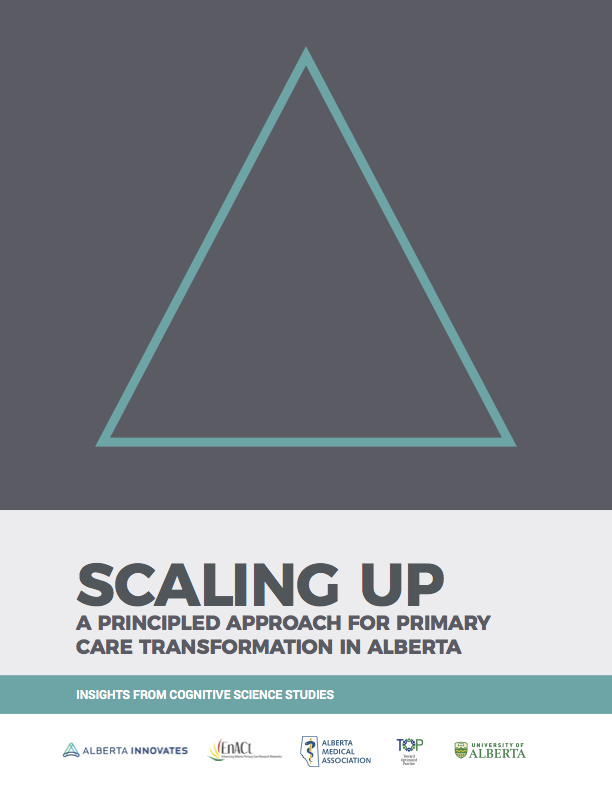 Understanding the decisions and processes that take place when change is implemented in a variety of mainstream (early in their transformational journeys) primary care teams in Alberta allows for more effective strategies to be developed for broader engagement. Preliminary findings indicate that in order for widespread transformation to be successful (crossing the valley of death) teams require: deliberate effort among the team to "create and be on the same page", examples to apply locally; deliberate planning approaches - big picture and small tests of change; mechanisms to build team rapport and trust (face-to-face interactions); and sharing and owning the work of change (requiring equal footing and psychological safety). The aim of the AFPEE study (now complete) was to see whether family physician colonoscopists are reaching quality assurance benchmarks. Nine physicians at 11 sites were successfully recruited and more than 1700 procedures were entered. Findings confirm that family physicians are surpassing the benchmarks (e.g. proportion of successful cecal intubations targeted at 90% where family physicians participants were at 98%; patient comfort was targeted at less than 10% for moderate or significant discomfort where family physician participants held at 3.3%). The results of this project demonstrate that family physicians are performing high quality colonoscopies and that providing an electronic data collection tool improves data collection, reporting, and measuring quality benchmarks. Next steps include plans for future training programs for physicians, further studies involving other provinces, and developing the tool to expand nationally so all family physician colonoscopists and specialist colonoscopists are able to report their quality measures, receive feedback and self reflect on their practice - thus closing the practice loop. The Cognitive Task Analysis (CTA) stream of the KOASK project was to gain an understanding of how family physicians think about managing early knee osteoarthritis (KOA) in real-world practice. We also wanted to know if family physicians would use or recommend a mobile-health risk management tool. Our findings revealed family physicians would not use or recommend a mobile-health risk tool but did suggest a mobile-tool be used by patients for self-management. Moving forward the aim was readjusted to focus on a tool that would increase patient and physician communication and engagement in terms of shared decision-making and evidence-based self-management planning. Co-design sessions involving physicians, patients, and members of the research team were completed and successful outcomes included recommendations on the needed features and functions of the self-management KOASK App. Next steps include meeting with App designers to create a proto-type based on the patient and physician suggestions.